QuickSurf will not speed up your Internet connection, but it claims to speed up certain processes. If you choose to trust the official information, the program is supposed to save you the time spent looking for information. QuickSurf is promoted as a beneficial search and translation tool, but this is not how most users and malware researchers see it. Once installed, this program immediately connects to adware servers enabling ad-injection. Fortunately, these ads are marked in a clear manner, which means that you will not need to spend time figuring out which program they belong to. Do you want to delete these ads? Then it is time to think about the removal of QuickSurf. Just like Wordinator and WordShark, the suspicious QuickSurf is supported via advertising. This means that its developers manage to offer free services only because they earn money by promoting third-party services/products. 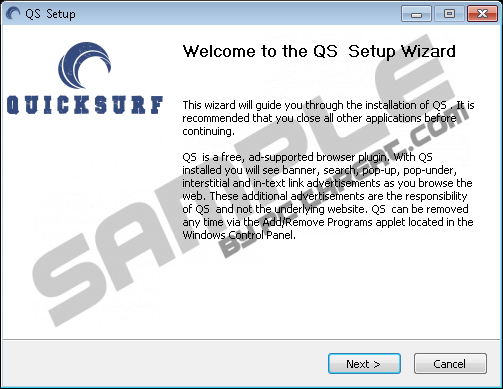 If you do not delete a process called qssvc.exe*.32 (QS Client Service), a connection to a remote adware server will be made and the partners of QuickSurf will be enabled to inject ads into the websites you visit. We have found that most of these ads show up with the tag “powered by QUICKSURF." Removing these advertisements is very easy, as it is enough to uninstall one single program. Despite this, many users do not want to go through with this because they value the services provided by QuickSurf. The fact that QuickSurf shows advertisements is not kept in secret. If you visit QuickSurfapp.com, you will immediately find information that this program shows “banner, search, pop-up, pop-under, interstitial and in-text link advertisements as you browse the web”. Of course, if you have downloaded this program from a different source, all of this might be news to you. According to our research, QuickSurf can come bundled with third-party programs, and there is no way of knowing if these programs are genuine and trustworthy. What if malware came bundled with this adware without your knowledge? If this happened, we would recommend removing QuickSurf-related malware before taking care of the ad-supported program itself. We want to take this opportunity to talk about software bundling. As you might know already, cyber criminals often use software bundles to distribute malware. In most cases, the developers of programs bundled with malware have nothing to do with this malicious activity. While deleting QuickSurf is entirely up to you, the removal of malware installed along with this adware is not up for discussion. If you absolutely must use QuickSurf, you should acquire this program from its official source, not some suspicious site promoting unreliable and misleading offers. As stated previously, QuickSurf is not a clandestine or critically dangerous threat, and its removal is as straightforward as the removal of any undesirable program. In fact, we are sure that most users will not even need to refer to our manual removal guide when deleting QuickSurf to succeed. However, it is a very good idea to run a malware scanner afterward, especially if you have downloaded this adware from an unfamiliar software distributor. You might find that some of the files were modified to remain active, and you might find out which other threats require removal. Select QuickSurf and click Remove. Click the Windows button on the Taskbar and open Control Panel. Go to Uninstall a program and find the undesirable software. Right-click the program you want to delete from your PC and click Uninstall. Simultaneously tap Win+R to launch RUN, enter Control Panel, and click OK. Select Uninstall a program (under Programs or use the search box). Right-click the application you want to delete from your PC and choose Uninstall. Quick & tested solution for QuickSurf removal.